This is a very fresh and tasty yet simple salad. 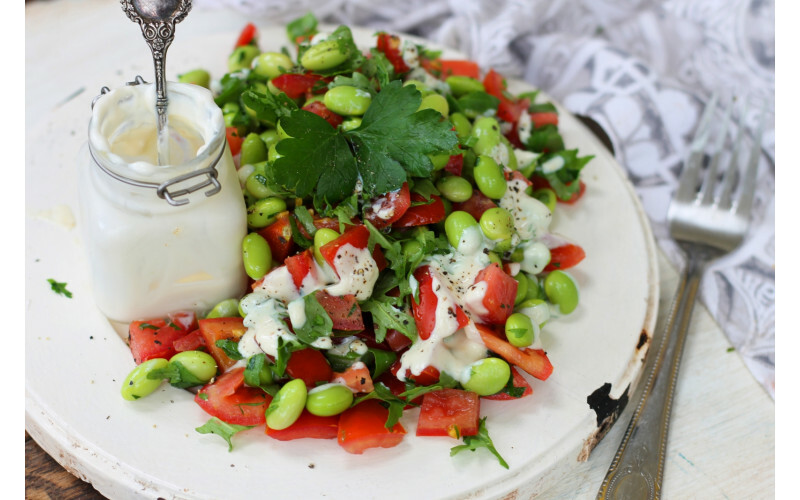 Make it with frozen broad beans or frozen green soya beans (edamame), both of which are good value and good sources of protein, especially the soya beans. Alternatively, try tinned flageolet beans. There are plenty of ready-mades like this recipe, sold in small pots, but they aren't nearly so economical. Smaller servings? It's easy to halve or quarter the quantities to make it into one or two servings only. Make it the night before, store in a plastic box and take it to work! Fresh herbs: use whenever you can afford them. If the supermarket weeny packs of herbs seem a rip off, it's easy and very cheap to grown your own - or else find a good local greengrocer to get bigger bunches for your money! 1. Lightly steam or microwave the soya/broad beans for a few minutes until tender – or if very fresh, use raw. If using tinned flageolet beans, just drain and rinse. 2. Meanwhile, prep the vegetables. Chop the tomatoes into small pieces. Chop the rocket with scissors and do the same for the herbs or chop them fine with a knife. 4. Mix all ingredients together in a serving dish. 5. Pour dressing over salad, stirring to coat everything well. Serve immediately.